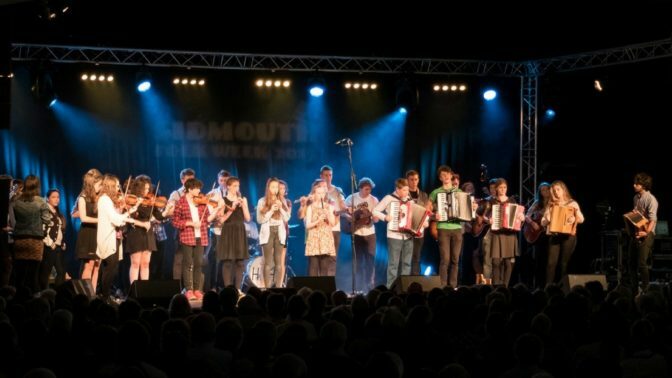 This is a fun but intensive course for young people aged 13-25, leading to a day of performances at Sidmouth Folk Week. It’s designed as a progression from our Spring Halsway Young Folk Intro Week, but if you’re new to Halsway, that’s ok; you’ll need prior experience as a musician or singer, and to have some folk experience, eg from taking part in workshops at Festivals, from going to courses at other venues, from playing in a school (or your own!) folk band. If you’re not sure, then get in touch. Here’s a short video from our Spring 2015 week, to give you a taste of what to expect! Places costs £195 (bed in the Manor) or £130 (camping in the grounds). All meals, tuition and activities are included in the price. Transport to Sidmouth is NOT included; parents will need to collect participants on Saturday morning and accompany them to the Festival for the day. Places are limited and will be allocated on a first come, first-served basis. Ford Collier (Assistant Tutor) formed The Drystones with fiddler Alex Garden at the age of just 14. They’ve been playing together ever since, including festivals appearances at Glastonbury, Sidmouth Folk Week, Larmer Tree and others. Ford attended Young Halsway residentials at Halsway Manor from the age of 16 and the encouragement of the tutors led him to take the tin whistle seriously as an instrument; it’s now his first study instrument in his music degree at Sheffield University. He is specialising in Irish music on the whistle, learning from brilliant Manchester whistler Grace Kelly and intends to pursue music, teaching and performance as a career. Claire Bailey will be joining the team in a dedicated pastoral role.